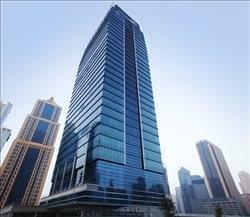 Find My Workspace lists over 95% of the serviced offices market in Jumeirah Lakes Tower. Simply click Request Quote to check pricing for one office, or Add to Basket for multiple offices. This business centre offers fully furnished offices with flexible configurations and flexible lease terms to accommodate any time frame. The space also offers an extensive range of stylish meeting rooms, fully furnished and equipped with the latest audio-visual equipment and outstanding views. In addition, an on-site café and common areas is great for informal meetings. There is 24-hour CCTV, office access control and building security. On-site receptionists, technical support, and maintenance team is available to help you every step of the way. Services include live-call answering provided by courteous on-site receptionists, daily mail delivery and outgoing postal service and print, scan, copy and fax capabilities using high-quality equipment. 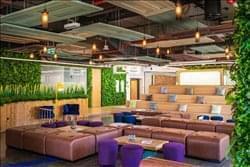 This centre located in Jumeirah Lake Towers has fantastic views of Dubai city, with the option of window offices, interior offices and office suites with meeting rooms. The business centre is found in a lakeside community of palatial towers intended for residential and commercial purposes. There are a range of amenities to benefit from in this working space, including communal areas such as break rooms and lounge spaces and kitchens. Offices come elegantly furnished, with plenty of natural light to maintain a refreshing atmosphere. An all-inclusive price will ensure you are not surprised with any hidden fees at the end of the month, and you can scale up as required by the growth of your business. A friendly and professional on-site management team will ensure you can work without worrying over the little things. The administrative support can aid with mail handling, telephone answering and secretarial tasks. High speed WiFi and telephone lines will allow you to work as efficiently as possible, and access to over 50 million global hotspots as well as business lounges will allow you to work whenever and wherever you want. This business centre offers a professional working environment with plenty of support to boost your company’s performance. An impressive reception area with a dedicated team is available to greet your guests, along with complimentary refreshments for your guests and clients. Working spaces come beautifully designed and can be configured to your requirements, along with high quality internet connection and IT support. 24/7 access allows you to work whenever you want, and a range of additional support is available ranging from personal assistants to legal support. Here you can also benefit from a swimming pool, gym and sauna access. This community of entrepreneurs offers you work stations in a collaborative space, allowing you to work and grow alongside like-minded professionals. Membership allows you access to a range of excellent facilities and amenities including round the clock access, allowing you to work at your own pace. High speed internet keeps you connected at all times and meeting rooms are easily booked to give you good accessibility. The centre will also provide you with coffee, snacks and office supplies. There are printing, copying and scanning facilities for your convenience. The centre offers a range of bespoke packages, allowing you all the flexibility you need from your work space. R- Serviced Offices is the largest serviced offices provider in JLT with a total space of 130,000 SQFT. Offices sizes range between 130 SQFT to a full floor of 12,000 SQFT. These offices are fully furnished and serviced and our services include but not limited to the following: Bundle package (Wi-Fi for the company (speed up to 100MBps / 25MBps) + 1 Landline Rental (Avaya IP Phone), Premium fast tier 1 internet connection and dedicated VLAN, Receptionist to answer the calls in your company name, Unlimited Meeting room usage, Professional multilingual support team, No Building Maintenance, AC or DEWA Charges to pay, Daily cleaning of the office and Complimentary beverages. To obtain information for your selected Jumeirah Lakes Tower Serviced Offices, please tick the "Add to basket" box for each office you prefer and complete the form below. We will then send a detailed report via email.